Fort Keogh (1876-1908) – After Battle of the Little Bighorn , on June 25, 1876, General Nelson A. Miles was sent to the area of present-day Miles City, Montana with orders to establish a fort. Choosing a strategic site where the Yellowstone and Tongue Rivers met, Miles established the fort on July 22, 1876, and it was first known as Cantonment on Tongue River. At this time, it was called the Tongue River Cantonment. 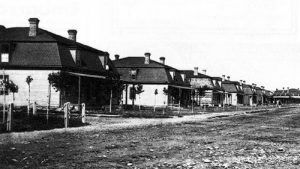 The fort was later moved to a site a mile west and was renamed Fort Keogh in November 1878, in honor of Captain Myles Keogh, an adjutant to General George Armstrong Custer, who was also killed in the Battle of the Little Bighorn. The settlement that grew up around the fort was named for General Miles. The fort included officer’s quarters, enlisted barracks, multiple outbuildings and a diamond shaped parade ground. The fort’s purpose was to continue to subdue the Indians, a task that was achieved by the early 1880s. By then most of the tribes had surrendered and were moved onto reservations. In 1907, all troops were removed from the site and two years later Fort Keogh became a Remount Station and supplied thousands of horses for World War I. In 1924, the station was turned over to USDA, which continues to utilize the site to this day. Of the some 100 buildings that stood at the fort in the late 1800’s, only four survive, including officers’ quarters and a brick structure that was used as a barn. The Range Riders’ Museum is housed in one of the officer quarters buildings.